Comic Con will be held in San Diego from July 21-24 in 2011. 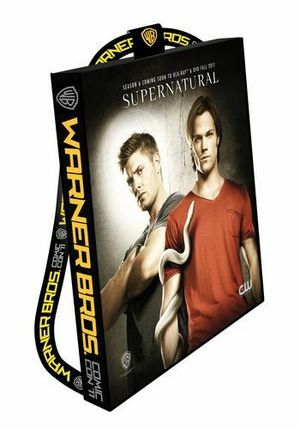 Supernatural Fans’ Guide to Comic Con - all you need to know about what's on, when to queue, and how to get the schwag. Supernatural had a panel on Sunday 24th July from 11.15-12.15 in Hall H. Guests were Jared, Jensen, Misha, Jim Mark Sheppard, Ben Edlund and Sera Gamble. The panel will be moderated by Eric Goldman, the Executive Editor for the TV channel at IGN.com. You can tweet questions you'd like to hear at the panel via @EricIGN. 11:15 a.m.–12:15 p.m. Supernatural Screening and Q&A – For the first time ever, the Supernatural panel will be in Hall H! Join series stars Jared Padalecki (Friday the 13th ) and Jensen Ackles (My Bloody Valentine 3D) and additional cast members and executive producers for an exclusive sneak peek at footage from the highly anticipated Season 7 of this thrill-ride series. The panel will answer questions from the audience; show a portion of the special features from the upcoming Supernatural: The Season 6 DVD and Blu-Ray in stores September 13; and give Comic-Con fans a sneak peek at Supernatural: The Anime Series coming to DVD and Blu-ray on July 26. There will not be an autograph session after the panel. There will be a special Comic Con edition of TV Guide. Warner Bros. Television Group will distribute copies of the magazine throughout the five days of Comic-Con International (July 20—24) exclusively at the Warner Bros. booth (No. 4545) on the floor of the San Diego Convention Center. The special issue will be available on newsstands beginning Thursday, July 21. It will contain a feature on Supernatural. Jared tweeted that his mate Zach Levi had asked him to be part of "Conversation For a Cause" at Nerd HQ at 2.30pm on Sunday 24th after the Supernatural panel. The Nerd HQ and activities are outside the Convention Centre, so you don't need a Comic Con ticket to attend. You can purchase tickets for the session here. All proceeds go to Operation Smile. ETA: tickets sold out. SPOILER ALERT: Material at Comic Con will contain spoilers for Season 7. Read at your own risk! Panel report by Vlada Gelman on TV online. This page was last edited on 9 March 2019, at 03:17.